NETWORK UPDATE: THE VOICE gained 0.1 in final numbers to 3.1 (STATE OF AFFAIRS held its 2.2). SLEEPY HOLLOW also rose 0.1. With local football simulcasts removed, DANCING WITH THE STARS reduced rose by 0.1 to 2.3 2.5, and CASTLE lost 0.2 to 1.8–although both were still up significantly from last week. MONDAY NIGHT FOOTBALL (ESPN) climbed 0.43 from last week to an even more dominant 4.53. VH1’s hot line-up had LOVE & HIP-HOP HOLLYWOOD up a substantial 0.35 to 1.59, K. MICHELLE: MY LIFE up 0.32 to 1.25, and TINY & SHEKINAH’S WEAVE up 0.15 to 0.87. 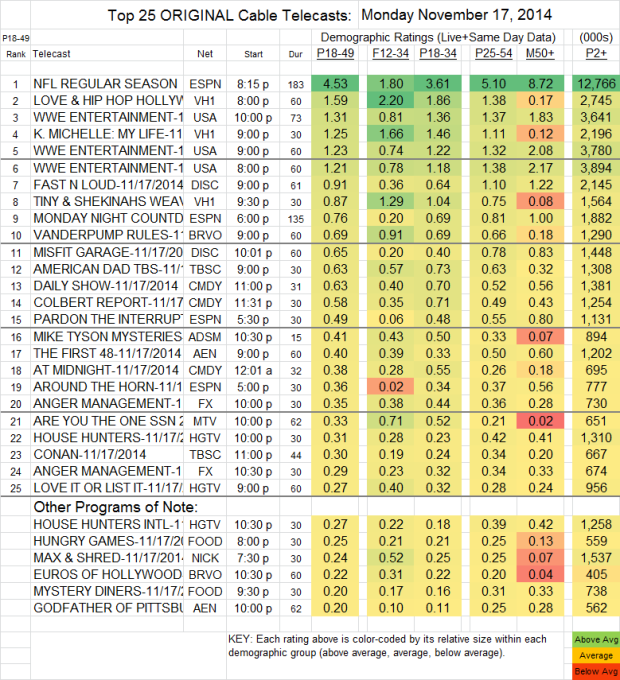 WWE (USA) was at 1.21-1.31 over its 3 hours, down between one- and two-tenths. Discovery had a good night, with FAST N LOUD up 0.19 to 0.91, and MISFIT GARAGE also up 0.19 to 0.65. VANDERPUMP RULES (Bravo) lost 0.04 to 0.69. AMERICAN DAD (TBS) gained 0.06 to 0.63. MIKE TYSON MYSTERIES (Adult Swim) lost 0.03 to 0.41. ANGER MANAGEMENT (FX) jumped to 0.35/0.29 from last week’s 0.21/0.19. MTV’s ARE YOU THE ONE rose 0.05 to 0.33.